Agenda must be posted on the Chat at least 4 days before a Community Meeting. Agenda items generally arise from suggestions from members, reports or proposals from teams, unfinished business from previous meetings, or standard Agenda items. Have you considered all these sources? Review outstanding Parking Lot topics, and discussions from the last few meetings. Is there any follow-up needed? Be sure that all members with known concerns about a topic have ample opportunity to participate in decision process. Be sure that items on the Agenda are appropriate for large group discussion rather than small group work. Purpose (what is to be accomplished). As a general rule, Agenda items should be introduced, discussed, and decided upon in separate meetings. Distribute any “homework” for participants, such as surveys, questionnaires, etc. Prepare copies of Agenda for distribution at meeting. This is a summary outline of the steps we take in reaching a decision. Not all of these steps are always used. Total process would usually take several meetings. Get agenda for the chat (4 days before Community Meeting). Contact whoever prepared the agenda and each Topic Guide in order to determine the priority of each agenda item and how much time should be devoted to it. Based on the time for each item, calculate the expected start time for each item on the agenda. Is the Agenda realistic for the time allotted? Review with each Topic Guide the Purpose, how much time they have, how specifically the discussion will be structured, and their specific role in the discussion. Are there any issues or concerns missing? Is consensus the appropriate decision making method for decisions to be made or should some alternative method be considered? Think about how to approach the agenda items. Are there any specific items which may need a special format for discussion or resolution? Determine what order agenda items will be addressed in. Stack the agenda so there is a mix between short, easy-to-deal-with items and more complex items. You may want to begin with some easy items to get warmed up and build a sense of accomplishment. Urgent items should be scheduled for the beginning of the meeting. Consider whether you’d like to work in a facilitation team. If so, recruit a teammate. Recruit any roles that you’d like assigned ahead of time (Keeper of the Heart, and Recorder should already be assigned). Check the environment and supplies. Have participants been notified where, when, and for how long the meeting is? Are there enough tables and chairs, etc.? Are they arranged OK? (A circle is the best shape to create a sense of equality and to facilitate eye contact. Are there refreshments or snacks available? Does the lighting set the right mood? Is the room comfortable? Warm enough, not stuffy etc? Is there enough space to do what you want to do? Do you have everything you need? Paper, pens, flip chart, etc.? Are you feeling good? Do you have the energy to facilitate today? Do you have any hidden agendas that you need to realize within yourself or put in front of the group? Can you remain neutral with respect to topics that will be addressed and people that will participate? Take time to silently prepare yourself. It may often be helpful to have 2 meeting times – one for gathering and socializing and the other 15 to 30 minutes later for when the real meeting begins. Up front time for socializing will help the meeting run smoother because people will feel connected with each other and they will have less need to socialize during the meeting. Check each person’s body language as they first come into the room and watch how they greet and talk with each other. Are people generally normal or is there tension in the room? Does someone have an obvious vibe that you might need to tap before the meeting starts? Acknowledge and introduce any new people. Get volunteers for unfilled roles. Helps to quickly bring everyone into the present moment. Helps people make the transition from being individuals to being members of the group. Can be used to connect individuals to the main purpose of the meeting. A candle and chimes are used as part of our ritual. Reading of the Vision & Values and Interpersonal Agreements. Reminds people of our core agreements — why we are doing this together. You may want to check yourself in to the group. Explain how you are feeling, any special things happening today, etc. Ask for feedback and help in making the meeting work well. Facilitation is not just the responsibility of the facilitator. The whole group has shared responsibility for a well run meeting. You may also want to give participants the opportunity to check in. Review and get agreement on meeting Agenda and Purpose(s). Ask for any additions or deletions. Introduce Agenda item, Purpose, Topic Guide, and possibly a Proposal. Topic Guide describes Agenda item and responds to clarifying questions. Clarifying questions are limited to achieving an understanding of what the issue or proposal is about, not venturing into opinions about it. As facilitator, you may want to stand up. Work to create a safe, creative, and cooperative environment — an environment in which disagreement can be expressed without fear. Criticisms can be heard not as attacks, not as attempts to defeat a proposal, but as a concern which, when resolved, will make the proposal stronger. Be absolutely clear about what topic is being considered, the Purpose, and what’s the method for addressing the topic. It may help to write down the topic under discussion so everyone can refer to it. Identify the criteria of an acceptable proposal (Proposal Criteria). Clarify and rephrase complicated or confusing discussion or have speaker do so. Don’t tolerate side conversations and interruptions. Note digressions and gently, but firmly, remind members to stay on track. Generate a wide variety of proposals – not just 2 or 3. Watch for comments which create a negative environment and make people afraid to speak and point those comments out to the group. Summarize underlying agreement and disagreement. Identify new topics as they arise. Ensure that all viewpoints are heard and understood, but without repetition. Identify problems with the group’s process and attempt to remedy them or at least ask others to help remedy them. Watch for hidden agendas and suppressed conflict. State the obvious about what’s going on with the process. Rely liberally on the meeting Purpose(s) and Ground Rules to keep on track. Watch for dominance of speaking time and guide members who speak too much to be briefer and those who are quiet to contribute more. Make sure you make eye contact with the people you speak to and when you get the group’s agreement on anything. Listen for and watch body language to catch any unexpressed concerns or feelings. 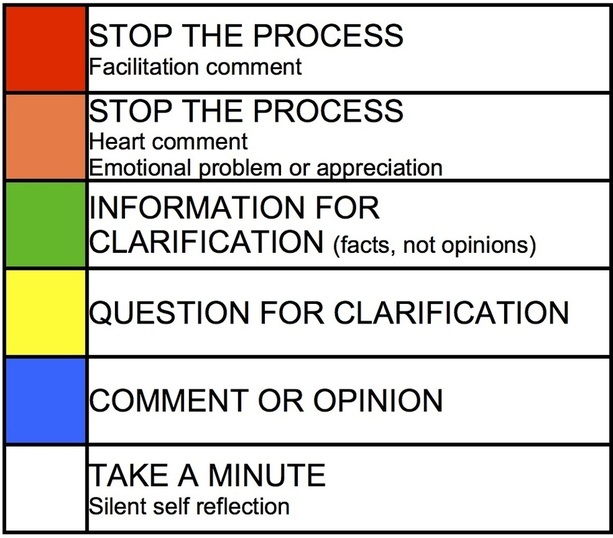 Open expression of feelings is vital for a healthy process. Summarize points and clarify discussion frequently. Catch any items which have not been resolved and ask the group what to do with them. Use “Parking Lot”. For contentious topics: 1) clarify; 2) validate; and then 3) deal with it or defer it. Get the group’s or the speaker’s concurrence whenever you summarize, clarify, rephrase, or in some way draw conclusions for the group or a speaker. This helps ensure that you share the same understanding with the others. If you wish to participate in partisan discussions, have someone else facilitate who is not involved in the discussion. “I’m not comfortable with . . . . .” is a good, non-aggressive statement. In case of disruptive behavior, instead of reprimanding with a statement, ask for a change in behavior. Most disruptive behavior will change with direct, gentle feedback. In case of disagreement, get: 1) facts; 2) implications; and then 3) alternatives. Manage the clock (either by yourself or with the help of a Time Keeper). Watch time assigned for items. Let the group know when time is running low. If an item’s time runs out, let the group decide whether to continue on the item or to move on. Keep the pace comfortable. Not so slow that the meeting drags and not so fast that members feel rushed. Watch for restlessness and take breaks when you sense the need for one. Try not to allow more than an hour between breaks. Note: There are numerous specific recommendations on how to handle difficult situations in the Facilitation Tools including recommendations for “WHEN CONFLICT ARISES” and “WHEN PEOPLE GET VISIBLY ANGRY”. Have the group consider whether an alternative method of decision making may be more appropriate than consensus. If so, take an Alternative Method vote. Help the group grab elements of agreement as they emerge in discussion and formulate them into conceptual proposals. Ideally proposals are drafted outside of the meeting by a team based on Proposal Criteria or conceptual agreements previously decided upon by the whole group. For short proposals prepared before the meeting, write up proposal on flip chart. For long proposals prepared before the meeting, give each participant a copy. For proposals created or modified during the meeting, simply capture the essence of the proposal as a conceptual agreement and avoid large group wordsmithing. When exact wording is required, consider assigning a team to do it outside of the meeting and decide on final proposal at future meeting. If a proposal doesn’t come easily, consider assigning a team or task force to work on the proposal. The whole group may decide on Proposal Criteria for the team to use. What should the proposal accomplish, budget, other restrictions? Major concerns are listed on flip chart indicating who has concerns and what the concerns are. These results of the straw poll direct the rest of the discussion. Each major concern is discussed until the person(s) holding the concern feels that the concern has been satisfactorily addressed. Be open to modifying the proposal, keeping in mind that proposals in consensus decision making are fluid and mutable. They are works in process which we sculpt to serve our needs. Proposals may not be modified and consensed at the same meeting, however, because of the need to allow for Absentee Voting. If the topic is extremely contentious, consider putting off a decision until a future meeting to allow participants more processing time. After all of the concerns have been heard and addressed, call for the final vote. 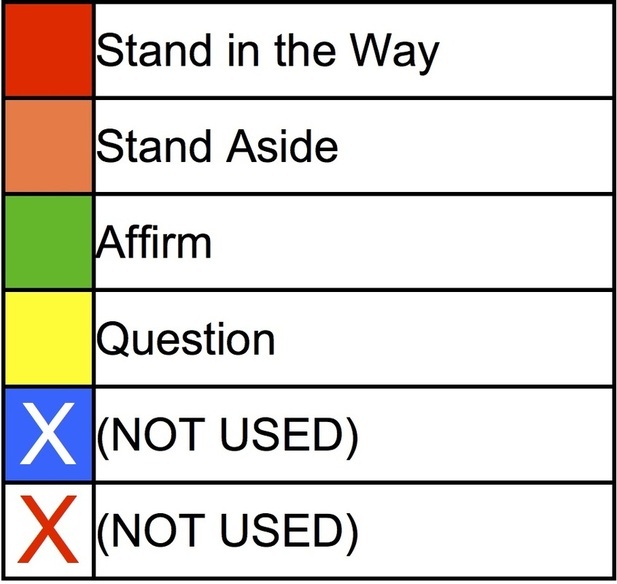 Consensus is achieved when no red cards are used. Before voting, have Recorder restate the proposal. Clarify how the decision is to be carried out – by whom, when, etc. Review with the person standing in the way what their responsibilities are (detailed in the Decision Making & Meetings Agreement). Confer with others whose judgment you think would be useful at this time and discuss a course of action. Reconvene the meeting. Explain to the group their responsibility, the individual’s responsibility who is standing in the way, and the plan to resolve the impasse. Group may decide to postpone or abandon the proposal. Reconsider whether an alternative method of decision making would be more appropriate. An alternative method should not be employed simply because consensus cannot be reached, but should be used only when it is truly more appropriate. Group may continue to pursue consensus following procedures outlined in the Meetings Guidelines. End on time, or get groups agreement to extend. Review the Agenda, Purpose(s), and outcome. Recap decisions made and tasks assigned. Ask participants to critique the meeting. What went well? What could be improved? What to do more of, less of, or the same next time? Get volunteers for clean up, if needed. Thank everyone for their participation. Conclude with an activity to reconnect everyone before adjourning. Intervene when needed, but not too much? What did you learn for next time? What did you enjoy most about this meeting? 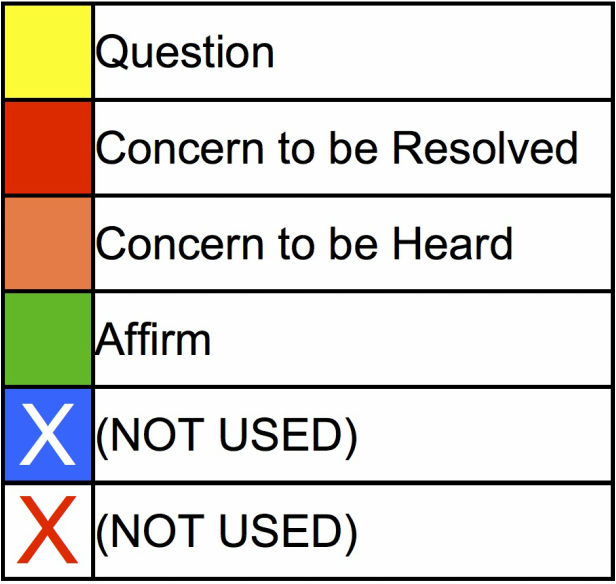 Check in with Facilitation Observers (if any) for feedback.